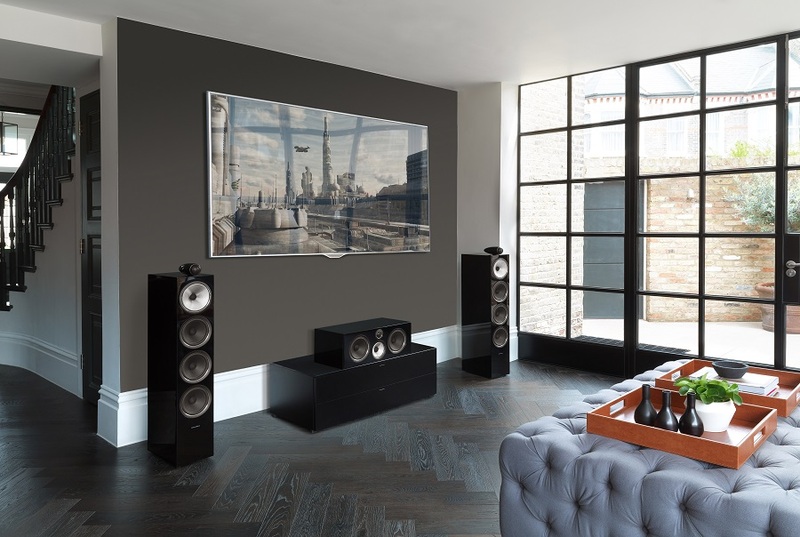 Designed as a more affordable version of Bowers & Wilkins flagship 800 Series Diamond, the 700 Series 2 loudspeakers retains much of the same technology. Each speaker includes the same classic tweeter-on-top design, improved Continuum midrange cones, and Aerofoil bass cones. As for new technology, there is now a carbon dome tweeter. Not only do these features result in precise reproductions of your favorite audio recordings with great sonic images placed within a wide soundstage, but they're great for surround sound installations as well. In both surround sound and 2-channel systems, they’re exceptional at defining distinct audio images, whether it is a solo instrument or a 100-piece orchestra! The slender floor-standing 704S2 benefits from much of B&W’s sophisticated engineering. Here the tweeter and midrange drivers are decoupled from the cabinet to avoid vibration and reduce coloration. On the bass side of things, there are twin 13-centimeter drivers combined with dimpled reflex ports to help keep the low notes tight and tuneful. How do they compare to the 702S2s? For the most part, they offer the same type of crisp, powerful audio and stereo imaging. Especially within the midrange tones, there is excellent nuance and texture. They are not quite as “open” sounding in the upper midrange/treble area and don’t have as much authority in the bottom end, but still pack a pretty good punch! In the 700 series, the 705S2 is the top bookshelf/standmount speaker. Atop the small enclosure is a 1” tweeter and the 6.5” midrange/bass driver is in the small cabinet. Due to the more compact design, the Continuum cone serves as both a midrange and bass driver. The sound is extremely coherent with natural mid-range and the precise imaging of the larger speakers. Bass is a bit more limited, but surprisingly deep for such a small enclosure. Next in line is the 706S2 which is the second smallest standmount speaker in the series. Despite its compact size, its powerful enough to fill large living areas. You could think of this very similar to the 705S2 but without the tweeter on top. Like its sibling, it has excellent full-range performance for its size. Intended for smaller rooms than the 705S2 and the 706S2, it is exceptional as a near-field monitor or traditional bookshelf speaker. Yes, we do have a few people who LOVE using small speakers for their precision imaging and low cabinet diffraction/coloration and then augment the low end with a powered subwoofer. We are happy to play this combination for you! Experience the real power of these speakers as we pair them up with high-end electronics from McIntosh in our dedicated sound rooms. For our demos, we also have a wide variety of tracks available to showcase the depth of sound offered by all of the 700 series models. Ready to check out these speakers for yourself? Schedule an appointment to demo them at our showroom by filling out our online form or calling us at (508) 879-3556.